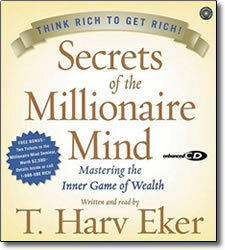 Secrets of the Millionaire Mind reveals the missing link between wanting success and achieving it! Have you ever wondered why some people seem to get rich easily, while others are destined for a life of financial struggle? Is the difference found in their education, intelligence, skills, timing, work habits, contacts, luck, or their choice of jobs, businesses, or investments? The shocking answer is: None of the above! In his groundbreaking Secrets of the Millionaire Mind, T. Harv Eker states: “Give me five minutes, and I can predict your financial future for the rest of your life!” Eker does this by identifying your “money and success blueprint.” We all have a personal money blueprint ingrained in our subconscious minds, and it is this blueprint, more than anything, that will determine our financial lives. You can know everything about marketing, sales, negotiations, stocks, real estate, and the world of finance, but if your money blueprint is not set for a high level of success, you will never have a lot of money—and if somehow you do, you will most likely lose it! The good news is that now you can actually reset your money blueprint to create natural and automatic success. Secrets of the Millionaire Mind has two parts. Part I explains how your money blueprint works. Through Eker’s rare combination of street smarts, humor, and heart, you will learn how your childhood influences have shaped your financial destiny. You will also learn how to identify your own money blueprint and “revise” it to not only create success but, more important, to keep and continually grow it. If you are not doing as well financially as you would like, you will have to change your money blueprint. Unfortunately your current money blueprint will tend to stay with you for the rest of your life, unless you identify and revise it, and that’s exactly what you will do. According to T. Harv Eker, it’s simple. If you think like rich people think and do what rich people do, chances are you’ll get rich too!